As much as I enjoy baking, frying, and roasting, I must say that pressure cooking is also a favorite cooking method of mine! I own more than one Instant Pot and often use 2 at a time. 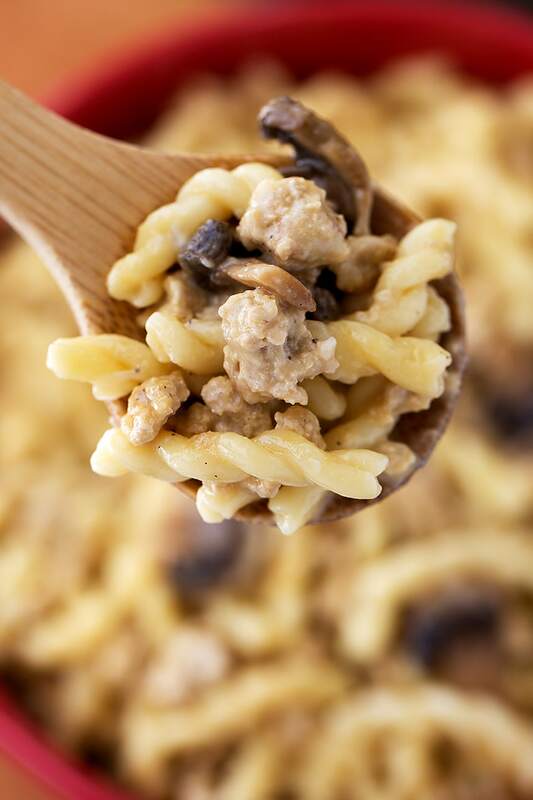 For this Instant Pot Cheeseburger Pasta, you only need one pot, and it comes together pretty quickly, which is so great when you have a horde of ravenous loved ones to feed on a weeknight! One of the first meals I made in my Instant pot was mac and cheese. Very basic, but tasty, and so easy! I loved that I didn’t have to deal with a pot of boiling water, and drain the pasta! Nope, in the IP the pasta soaks up the liquid (which is why I like to use broth, yum!). I started experimenting a little because I really like a mac and cheese that is loaded. Bacon was my first add in, and turned out really good! I just went nuts from there. 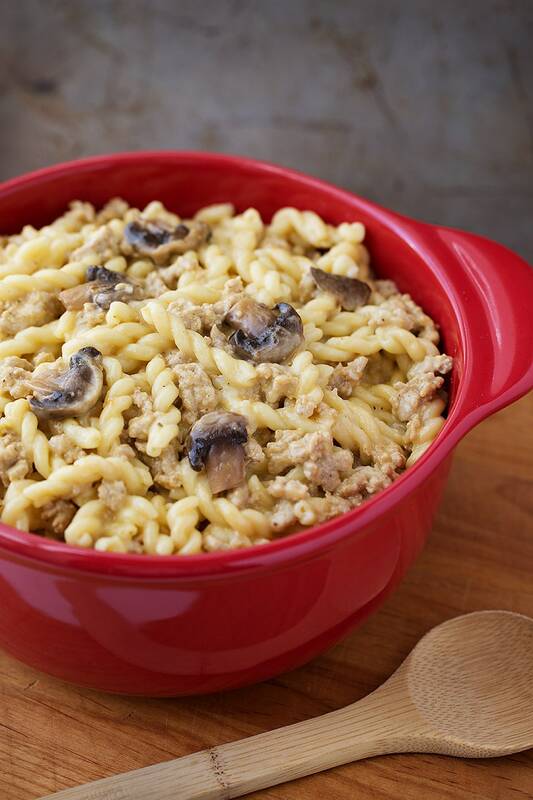 One thing I missed from my childhood was Hamburger Helper. Remember that? Do they even still make it? On the nights when mom didn’t cook, and we had to fend for ourselves, we often made that boxed stuff, and we loved it! 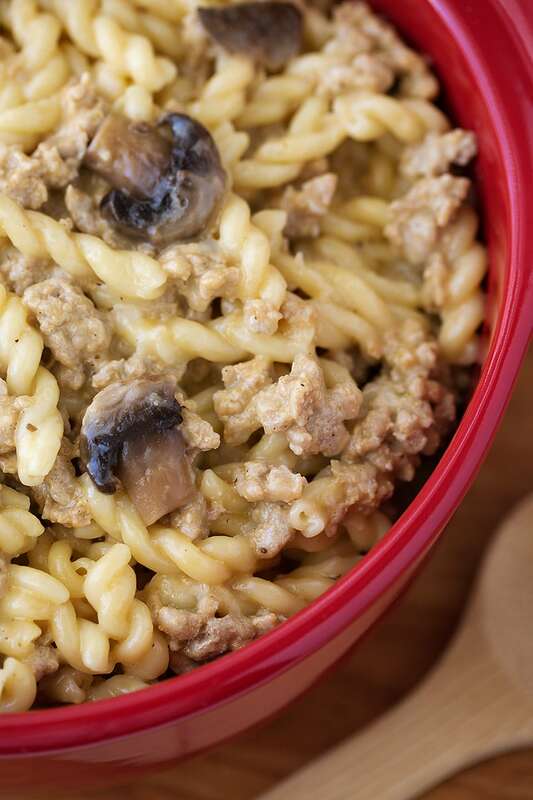 Instant Pot Cheeseburger Pasta is a bit healthier than the boxed stuff, and really versatile, as so many of my recipes are. I like them that way! Here are some more of my Instant Pot recipes for you to try. Have fun! P.S., When I cook Mac and Cheese in the 6 qt. Instant Pot, I use a nonstick ceramic liner. It’s so easy to clean! Okay, since Paul usually does the dishes, or helps with them, he REALLY appreciates anything that is easier to clean! 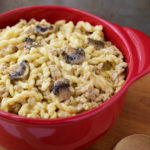 Use your Instant Pot electric pressure cooker to make this tasty one-pot pasta meal in under an hour! Press the Sauté (Normal) button on the Instant Pot. When the display reads “Hot” add 1 Tbsp olive oil. Add the ground meat and let cook for a few minutes before you stir it. Then break it up and let it sit a few more minutes. This helps it brown a little better. Continue cooking, stirring occasionally, until almost done. Add garlic and butter. Stir, making sure to scrape up any brown bits on the bottom of the pot. Add the mushrooms, seasoned salt, Kosher salt, pepper, ground mustard, and hot sauce. Stir well to combine. Add in the pasta, broth/water, and milk. Stir to combine and make sure the pasta is covered with liquid. Press the Manual button and the + or - button to select 4 minutes (or 1/2 of the time on the package directions. The gemelli pictured said 9 minutes, so I chose to cook it for 5 as it is a heartier pasta), and make sure that High Pressure is also selected. When cooking time ends and the unit beeps, do a Quick Release (QR) (slowly at first, in small bursts) of the steam. When the steam is all out and the pin drops, carefully open the lid, facing away from your face. Stir in cheese and heavy cream, if using, and allow it to melt. Stir in a little more broth or milk before serving if you like it saucier. Calories are based on using Lean Ground Turkey, 2% milk, and no Heavy Cream, and are approximated using an online program to calculate.